Bushtracks Africa and Sun International, offer a unique experience on the historic Mulobezi Railway line, formerly one of the largest private railway networks in the world. The train operates on Wednesdays and Saturdays and is if available for group bookings or private hire. The Royal Livingstone Express consists of 5 air-conditioned carriages, 2 dining cars, a club/kitchen car, lounge car, and an observation car and is pulled by either a 10th class No. 156 or a 12th class No. 204 locomotive. Guests are collected from the Royal Livingstone Hotel at 17h00 and transferred to the old Mulobezi Line Offices, where guests board. The train makes its journey through the Mosi-oa-Tunya National Park, running parallel to the Zambezi River At the Sinde Siding the locomotive detaches and 'runs around' to the back of the train for the return journey. 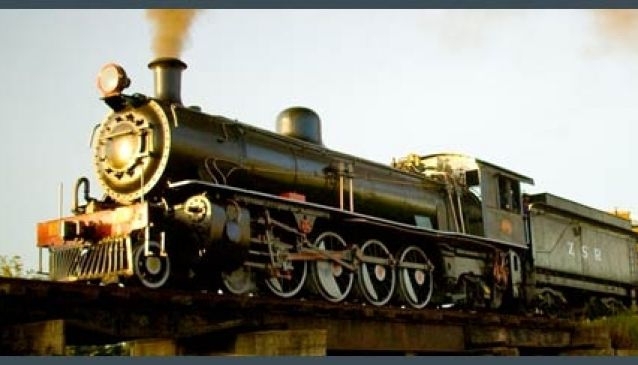 Guests are invited to the dining car for a five course meal with wine, beer and soft drinks, returning to the Mulobezi Siding at approximately 21h30 and back to the Royal Livingstone Hotel at 22h00.